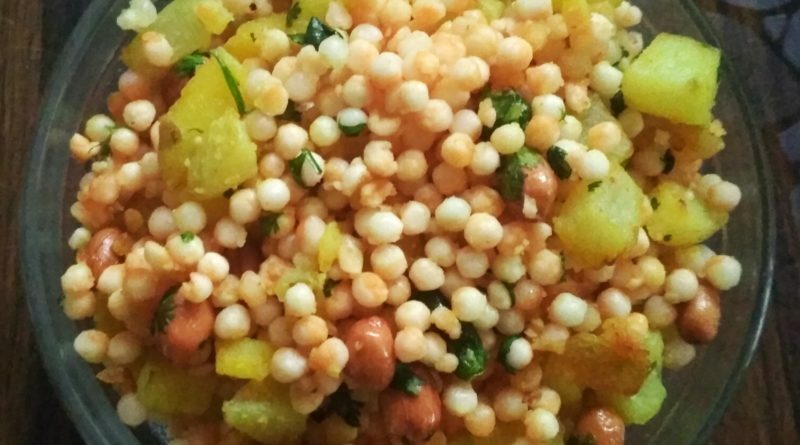 Sabudana khichdi is also known as sago khichdi. sabudana khichdi is one of the popular dishes in India and especially more popular snacks during vrat or upvas season.there are some other dishes you can make with sabudana like sabudana vada, sabudana thalipeeth,sabudhana kheer(sweet dish),sabudana paniyaram,sabudana bhel, sabudana chiwda and many more. Heat oil in frying pan and keep the flame low. deep fry peanut and keep it aside. fry on low flame. next, add cumin seed and mustard seeds .and stir it 2-3 times. next, add small cube size potato and chopped green chili.and saute it, keep the flame low. cook on a low flame until potatoes get cooked and become little brown, and flip it occasionally. add fried peanut and mix well. add red chili powder, salt and mix well. then add soaked sabudana to the pan and mix well, and stir it for sometimes. next, add chopped coriander from the top. now cover the pan and let it cook for more 5 minutes. your sabudana khichdi is ready to serve with tea. you can use roasted peanut instead of fried peanut.